The square contains the Monument to the People's Heroes, the Great Hall of the People, the National Museum of China, and the Mausoleum of Mao Zedong. Mao Zedong proclaimed the founding of the People's Republic of China in the square on October 1, 1949; the anniversary of this event is still observed there. 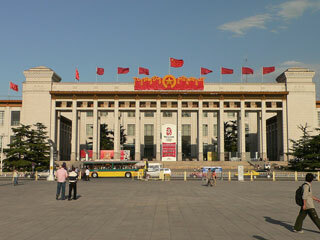 Tiananmen Square is within the top ten largest city squares in the world (440,500 m2 - 880×500 m or 109 acres - 960×550 yd). It has great cultural significance as it was the site of several important events in Chinese history. This article uses material from the Wikipedia article "Tiananmen Square", which is released under the Creative Commons Attribution-Share-Alike 3.0 License.